The Body Shop Hemp Hand Protector | £5 for 30ml or £11 for 100ml // This is one of my favourite hand creams and I think this is either my second or third tube. It is incredibly moisturising so you only need a tiny amount especially if you're using it during the day. I tend to save it for night just before I go to bed so I can apply a little bit more and it acts as a treatment while I sleep. The worst area for my eczema at the moment is my hands as I'm constantly washing and using hand gel in work and am then out in the cold waiting for the bus. This hand cream really helps to soothe my skin and keeps flare ups to a minimum. I also love using this as a food cream as I find it more moisturising than the Hemp Foot Protector. I've grown to really like the scent although I know some people will hate it, try smelling it in a shop if you can. Liz Earle Foot Spritzer | £7.75 // This is an essential product for me during the summer or if I can on holiday especially if I'm walking around a lot and it's hot. A spray or two of this and your feet will instantly feel refreshed and cooled down. It has a lovely menthol peppermint scent with a hint of rosemary and it dries almost instantaneously. 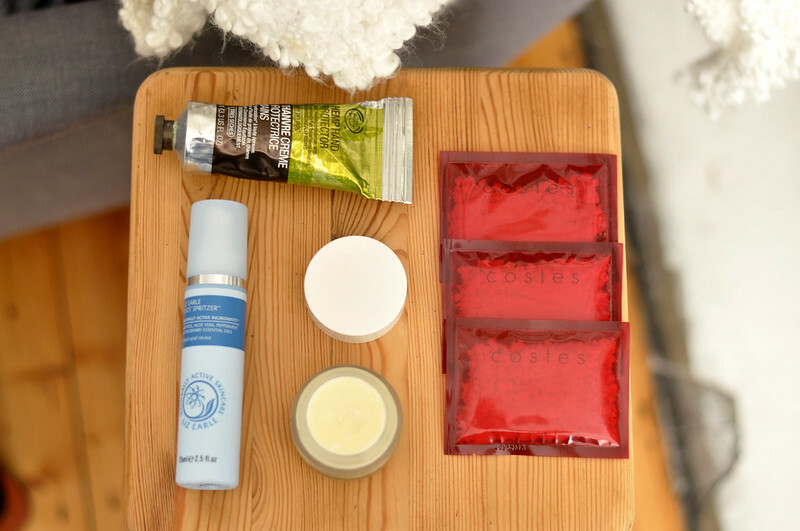 It comes in quite a small bottle so it'll easily fit in your bag or even in your carry on as it's under 100ml. If it's particularly hot and we have a heat wave then it feels amazing on your skin if you keep it in the fridge. 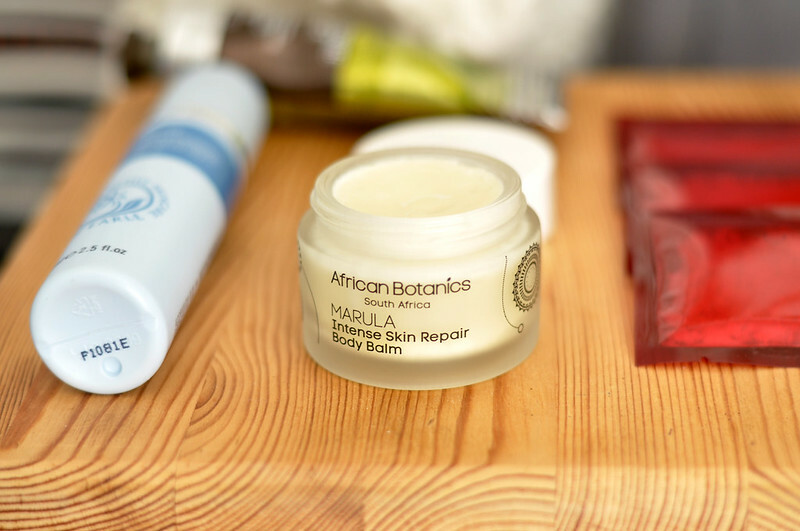 African Botanics Marula Intense Skin Repair Body Balm | £40 // I ordered this as it was a recommendation for soothing and healing eczema. It's expensive but when it comes to my eczema and how long I've had it, price doesn't really come into it for me. I'd prefer to pay more if it's going to stop flare ups. Saying that, I was a bit disappointed with this. It works amazingly well at moisturising the skin especially hands, elbows, knees and feet but I don't think it works any better than the balance Me Stellar Face Balm which is half the price. Apart from keeping my skin from being dry and flaky, I didn't really notice a difference when using it on my eczema. It didn't go away any quicker but keeping my skin moisturised does help but I can do this by using a cheaper product. I also find this quite hard to use as it's a solid balm that you have to scoop out with something otherwise it'll get all under your nails which I hate. You also have to warm it up in your hands first before you apply it so it turns into an oil otherwise you'll be waiting forever for it to sink in. Finally, the smell. I don't hate it but it's a very strong floral scent that I don't always feel like wearing. Save your money and try the balance Me version. Costes Bath Flakes | £21 // Costes Bath Flakes infuses all the grandiose personality of the famous Hotel de Costes on rue St-Honore in Paris into your bath time, with bubbles that last the distance. If you are lucky enough to visit the delectable Hotel Costes in Paris, this is the bubble bath they provide in the bathrooms. Created by cult Parisienne perfumer Olivia Giacobetti, the scent is a spicy, woody mix of coriander seeds, white pepper, laurel, oriental woods, incense, musk and a touch of rose. These bath flakes are salt-based so they not only upgrade your bath-time to a luxuriously fragrant bubble heaven, they also soften the water making the experience gentler on your skin too. This is another product I was pretty disappointed with. They come in a box of 10 sachets so you know exactly how much to use although I do think one sachet isn't enough for one bath but using two would be £4 per bath instead of £2. If you pour a sachet into running water it creates a few bubbles, nothing like what you'd get from using a Lush bubble bar, but enough to cover the water. The salts help to moisturise the skin and make the water feel nice. It's the scent that disappointed me. I was expecting something that smelt divine as the scent description on the Cult Beauty website sounds amazing. It smells really nice in the sachet but once you add it to water it just seems to disappear. I'm glad I've tried them but I won't be buying them and I recommend saving your money and trying something else. My whole family use the Hemp range, but I find it a bit greasy - I'm so intolerant of moisturiser! I love your mini reviews!